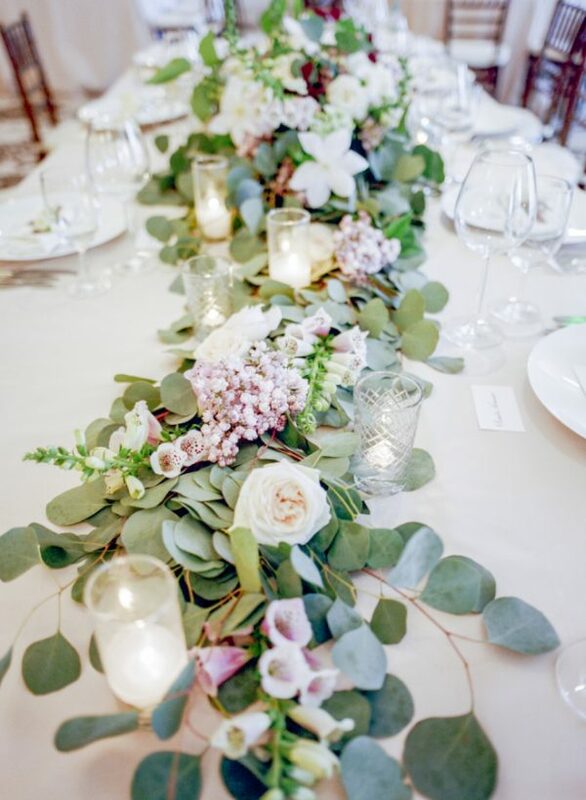 Now that Spring is well and truly here we thought we’d spoil you with some inspiration for Spring wedding centrepieces. 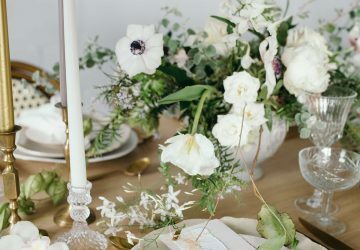 Choosing the perfect centrepiece for your wedding tables can be a difficult decision, as there is so much choice out there and you want it to fit in with your theme while making your tables look fabulous. 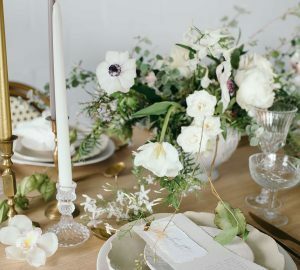 With a strong focus on beautiful seasonal blooms, we’re bringing you 10 of our favourite Spring wedding centrepieces. We think that a Spring wedding is the perfect match for a country garden theme. 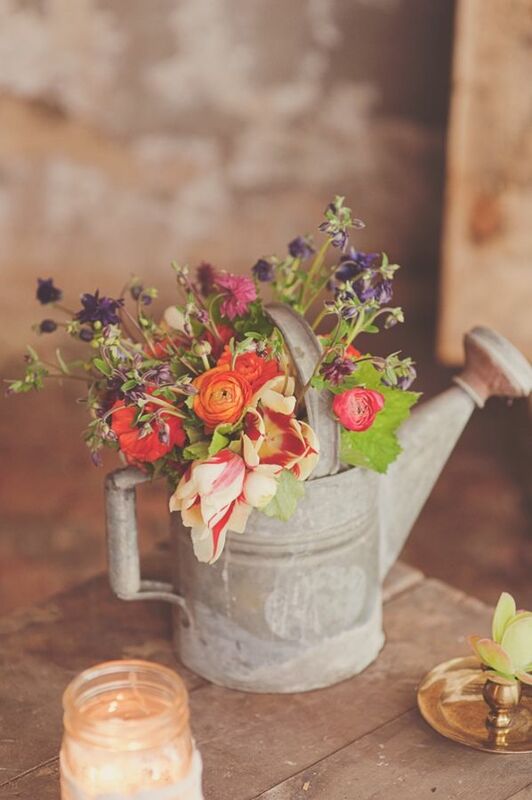 Style your wedding tables with a variety of mismatched watering cans and fill them with your favourite Spring blooms. Opt for Daffodils, Tulips and handfuls of Sweet Pea for a natural look that looks as if you’ve hand-picked them from your garden. You could collect different watering cans over the course of your wedding planning, or ask friends and family to help out. The best news is they won’t tug on the purse strings! 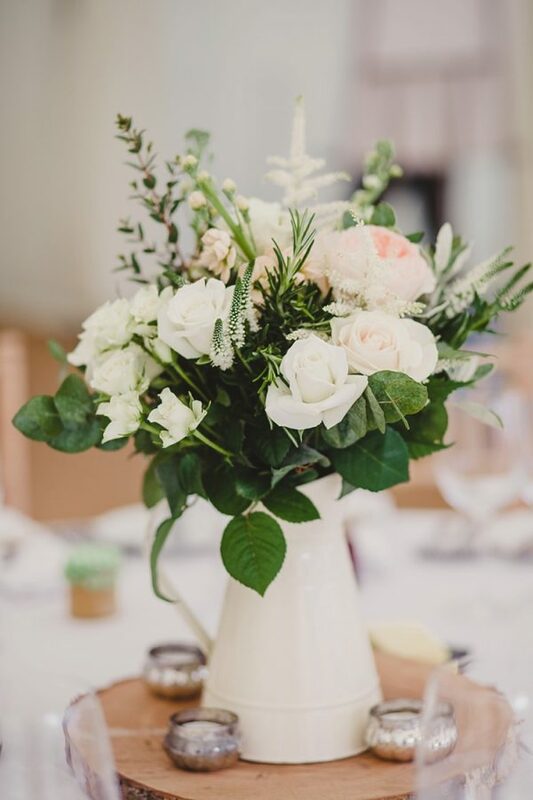 A cream jug is a beautiful way to display gorgeous Spring flowers, and it can suit any theme or style of wedding. We suggest placing it on a rustic wooden tree slice and surrounding the jug with lots of little tea lights for a shabby chic style. 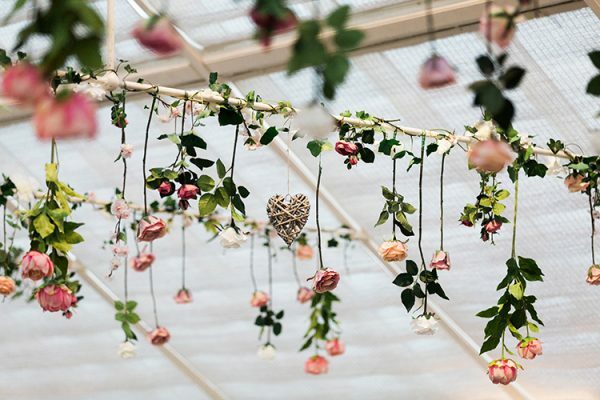 If you’ve got a wedding venue with high ceilings, such as a rustic tipi or marquee, why not use adorn wooden beams or poles with Spring blooms? This is a lovely alternative to a traditional centrepiece and it’s a fab way of decorating your venue. 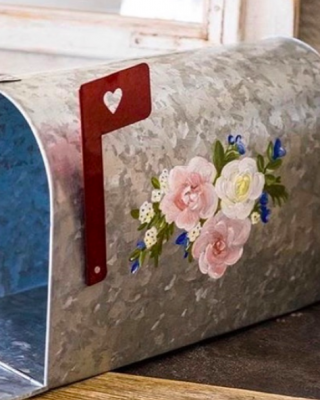 It will also save you heaps of space on your reception tables! 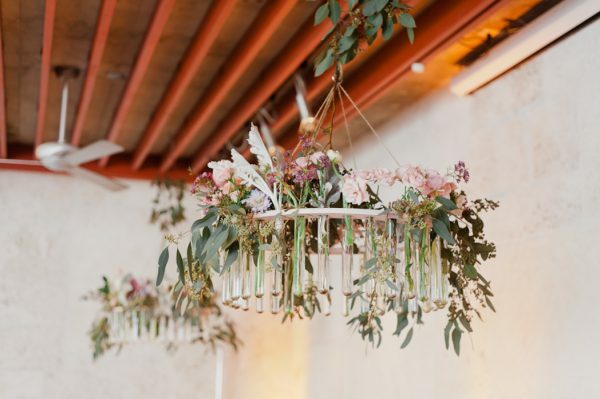 Dramatic chandeliers entwined with flowers and foliage make for a unique yet beautiful Spring centrepiece. They’re a wonderful choice if you’re not a huge fan of the chandeliers on their own, and they can look really elegant. If you’re tying the knot over the Easter weekend, why not incorporate the celebration into your wedding theme? 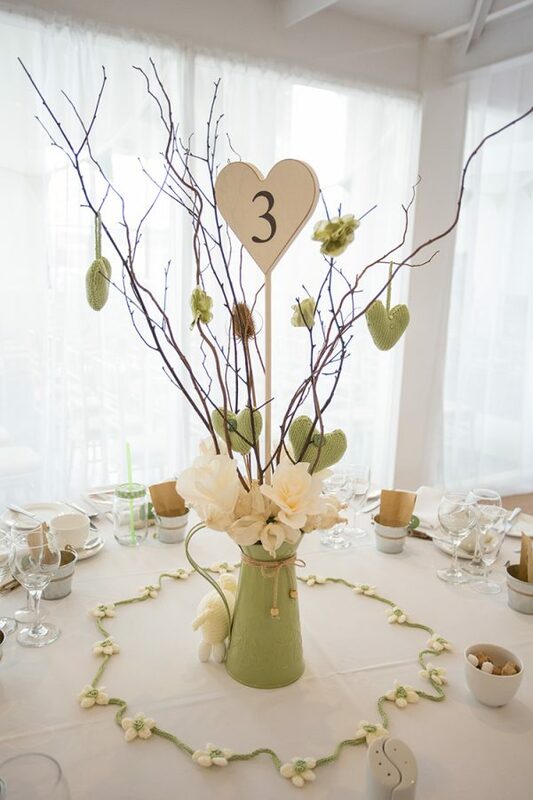 A traditional Easter tree is a lovely option for your Spring wedding centrepieces and they’re easy to pull together. Simply fill a jug, vase or pot with some dried twigs and hang little Easter ornaments from the branches. 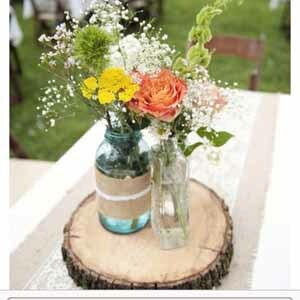 You could write your table number on the front of a jug, or place a small sign between the twigs. 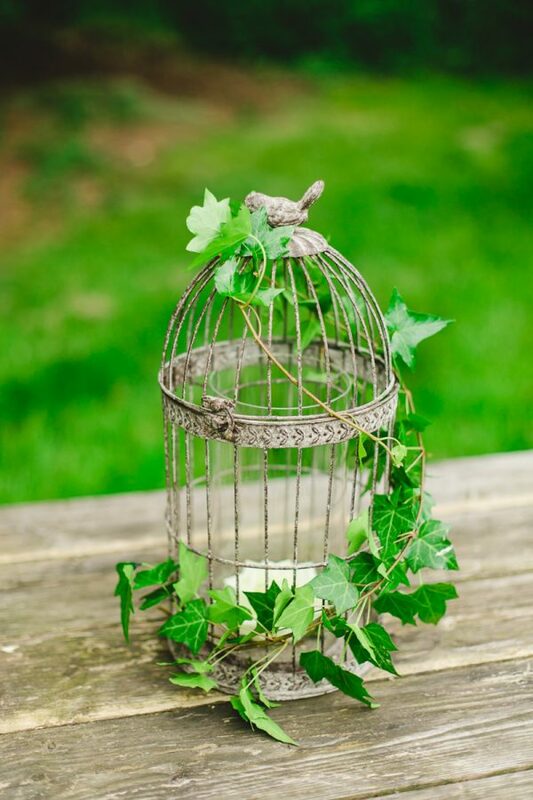 Birdcages make beautiful table centrepieces throughout the year, but they’re a super pretty addition for a Spring wedding. Trail ivy around the outside of the birdcage, or fill it bursting with beautiful blooms. Tea-lights and candles look lovely placed inside the birdcage, particularly in the evening. A pastel colour scheme is simply perfect for a Spring wedding. 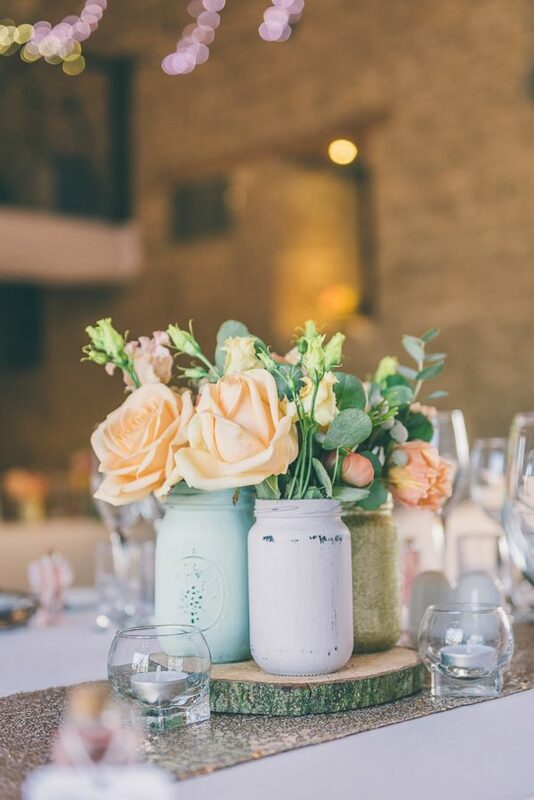 Painted mason jars in various hues of baby pink, sky blue and mint look gorgeous clustered together. 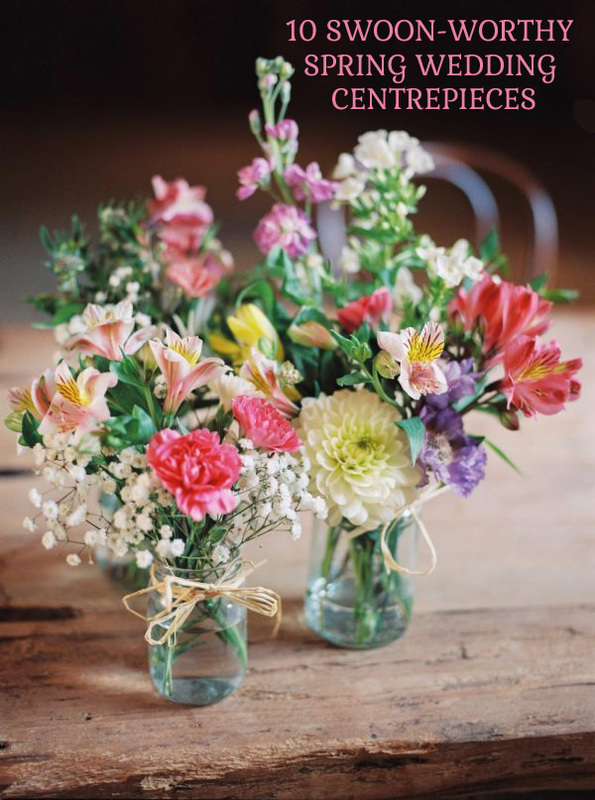 Fill the jars with tea-lights or seasonal posies, and you’ve got yourself some seriously pretty Spring wedding centrepieces. 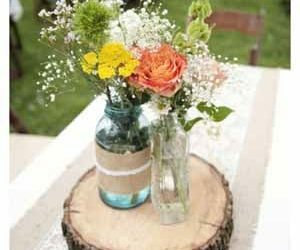 A rustic wedding theme has always been a popular choice for brides and grooms, and it’s wonderfully suited to a Spring celebration. A rustic wooden tree slice makes a fab base for your centrepieces, and it’ll help to give your wedding venue a woodland vibe. Wrap hessian or burlap ribbon around jam or mason jars and place a handful of pretty yellow blooms in each jar. Opting for yellow flowers will sprinkle your wedding day with sunshine, and it’s a subtle nod towards the season. Follow the theme throughout your wedding tables by using a hessian table runner and burlap wedding favour bags. If you’re planning on using long trestle tables at your wedding reception, you’ll need a centrepiece that lines the length of the table. 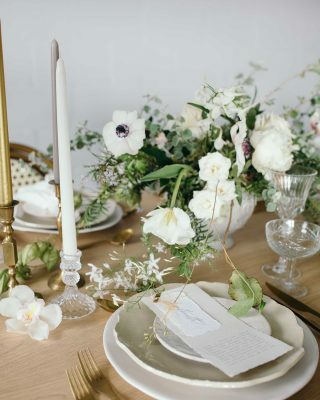 We recommend using an abundance of greenery to cover the centre of your banquet tables. Work in a few tea-lights, candles and colourful Spring flowers for an extra special touch. However, as you’ll know from Pantone’s Colour of the Year for 2017, greenery alone works just as well. 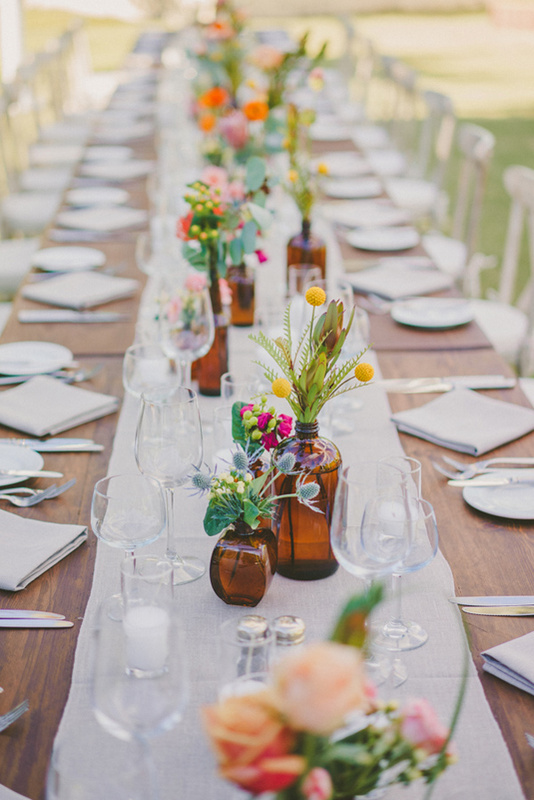 If you want to create a relaxed, whimsical wedding theme for your Spring celebration, listen up! 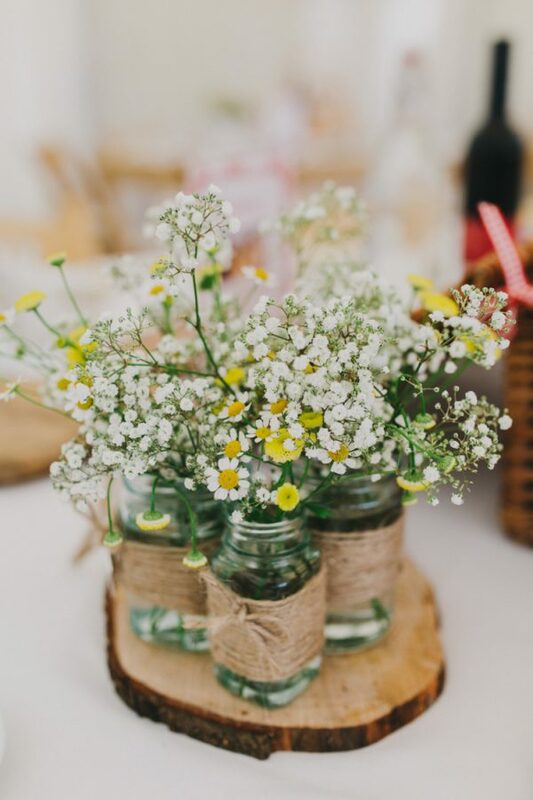 We suggest collecting a mixture of jars, bottles and small vases throughout your wedding planning. You’ll be able to source them at car boot sales, antique shops or over on The Wedding of My Dreams shop. Using a variety of different styles, colours and shapes will make your wedding tables look absolutely stunning. 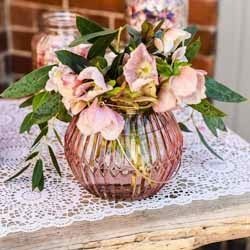 Place a single posy in each jar and line them along a wooden trestle table. This simple idea looks incredibly effective. A Spring wedding is a chance to reflect and celebrate the blossoming new season and the abundance of blooms. Opt for a variety of different flowers for a fresh and floral approach to your table centrepieces. 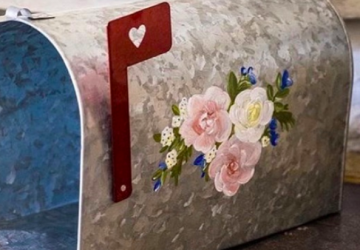 Are you planning a pretty Spring wedding day?